“Fifteen young children have died in a botched measles vaccination campaign that saw people as young as 12 years old administering the vaccines, South Sudan’s government announced Friday. So let’s reemphasize the meaningful facts before the anti-vaccine liars get a hold of these news and start to use them to attack the vaccination campaigns here in the United States. Second, 12 year-old children should not be administering vaccines. Yes, there is a shortage of trained professionals to administer vaccines because of the situation on the ground. But it goes without saying that this was a huge mistake. There are many things that can go wrong — and apparently did — during the administration of a vaccine, and I’m sure 12 year-old children are not trained to handle it. Third, even with the preservative thimerosal in it (which the MMR vaccine does not have, as it is a live-virus vaccine), vaccines can still become contaminated over the course of several days being open and not in proper storage conditions. Furthermore, needles can collect pathogens from all over the place, including people. They probably passed on those pathogens from person to person, causing all of this. “The civil war has killed tens of thousands and sent more than 1.8 million people fleeing the country, creating the world’s fastest-growing refugee crisis. So, when the anti-vaccine jerks tell you that it was the vaccine that killed these children, make sure to fire back with facts. When Andrew Jeremy Wakefield told us that it was his gut feeling that the MMR vaccine caused autism, I doubt that he had any idea of what he was about to unleash on the world. I really don’t think that he wanted to trigger outbreaks of vaccine-preventable diseases in places where vaccines had suppressed those diseases out of epidemic range and into sporadic range. I bet he was in it for the money. Get people to take less of the MMR and more of the vaccine that he was trying to patent. Like any industrialist, he wanted to crush the competition and give the people a reasonable alternative. That’s my theory, anyway. The truth could be more sinister and Andrew Jeremy Wakefield really was trying to cause outbreaks of measles like the one that engulfed Wales in 2012-13. That outbreak resulted in a little over 1,200 reported cases. The true number is probably higher, since not everyone sick was tested and a lab confirmation is necessary to call a case a “confirmed case.” In a country of just over 3 million people, the incidence of measles during the time period of the outbreak was about 40 cases per 100,000 residents. If you ignore the differences between Wales and the United States, this would translate to an outbreak of 128,000 confirmed cases in eight months in the United States. Like in the US, measles was declared eliminated in the United Kingdom at the beginning of this century when the incidence rate was less than one case per 100,000 residents per year. Because so many people decided not to vaccinate with MMR anymore in Wales after Wakefield’s fraudulent paper on MMR and autism, herd immunity against measles (a very, very infectious disease transmitted through the air) ended, bringing about the Wales outbreak. That outbreak caused a lot of people to become sick and at least one death. (The death rate from measles is about 1 in 1,000, so it stands to reason that 1,200 confirmed cases would lead to one confirmed death.) In the nightmare “all things being equal” scenario in the United States, we could expect about 128 people to die from measles. Death is not the only measure by which reasonable people should measure the impact of a disease on the population. There are other costs as well. There is the cost of parents missing work because they have to tend to sick children. There is the cost of medical care for those sick children. There is also the cost of tracing the contacts of the cases, and the people who are quarantined because they may be infectious will miss work and school. In the years before vaccines, this all used to cost a ton of resources to our societies. In the time since vaccines, we have been able to devote those resources to other things. It’s why we are living longer. It’s why you can sit comfortably in almost any place in the world and read this blog. “San Diego County now has 10 active measles cases, all of them linked to Disneyland visits in December, public-health officials confirmed Thursday. The only person in that bunch who was fully vaccinated against measles was the adult over 50. That’s it. The six siblings are not up to date on their vaccinations and, according to the news report, they are not enrolled in any public schools in San Diego County, California. Now there’s a list of places where they went while they were infectious. (A person is infectious before any symptoms appear.) Public health officials are asking anyone who is not vaccinated and was at those places to seek medical attention in order to contain the outbreak. The outbreak now stands at over two dozen people with more cases coming, according to my sources in public health at a national level. “A paper published in the American Journal of Epidemiology looks at these outbreaks and analyzes what it would take for measles to come back and be endemic in the United States again, or, at the very least, cause sustained epidemics. The paper is titled “Identifying Postelimination Trends for the Introduction and Transmissibility of Measles in the United States” by Blumberg et al. The authors looked at the sizes of transmission chains in outbreaks of measles and developed a mathematical model for determining the infectivity of measles and what several milestones would be for sustained transmission. In the paper, the authors concluded that the average size of a transmission chain is about 2 cases and that about half of cases are imported to the United States. In other words, a case goes out and brings measles and then infects one more person here, on average. Some chains are considerably larger. Other chains are not chains at all but single cases who return to highly immune communities. This assumes that all cases are properly reported to public health, which is not always the case from my experience. This is way below the threshold analyzed by the paper that Ren reviewed. It’s about 6 percentage points lower, meaning that the outbreak chain on average will be about 60 cases, if you follow the math from the model in that paper. In a civilised society where the vaccine is widely available, those kinds of numbers are nothing short of insane. So who is to blame for all this? Is it just Andrew Jeremy Wakefield bringing his MMR fearmongering to the United States after being so soundly rejected in Britain, stricken off the medical record and regarded as nothing better than a self-righteous quack? 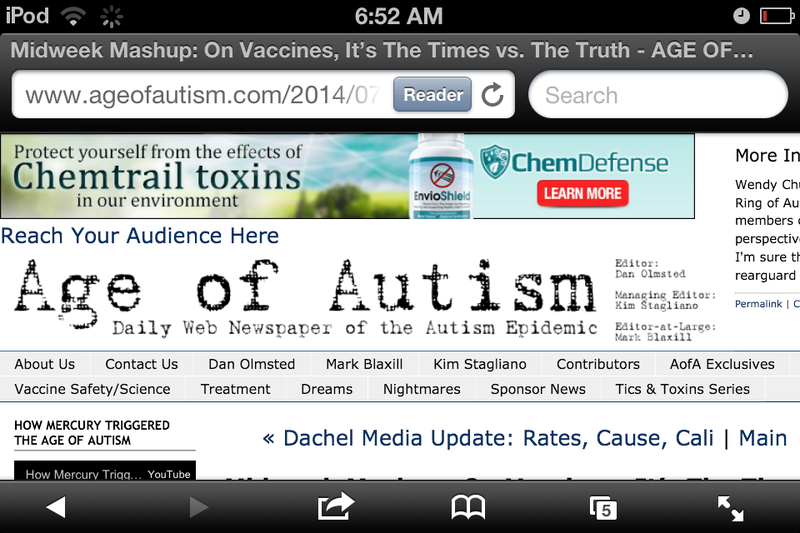 Is it the douchebag pediatricians who for some reason kowtow to “crunchy” moms and dads who are afraid of vaccines? Is is the other douchebag pediatricians who pull “alternative vaccine schedules” out of their asses and tell non-vaccinating parents that it’s okay to “hide in the herd”? Is it the fire science graduates who bloviate about the so-called dangers of vaccines and try to make themselves sound important when they’re nothing more than warm piss flowing down the drain of the truck stop restroom that is anti-vaccine activism? Yes, it is their fault, but there is more blame to be spread. 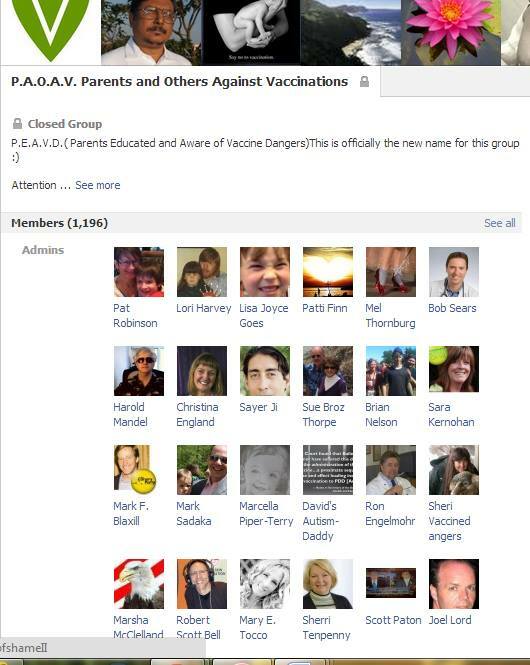 It’s the fault of people who think that it is a good idea for anti-vaccine loons like Sherry Tenpenny to travel to Australia and give talks about vaccines, spreading a dangerous message. It’s also the fault of well-intentioned public health professionals who want to defend her free speech right to do so. (Wink, wink, Ren.) People who know that vaccines work but don’t want to engage with the anti-vaccine nutjobs are also to blame for not speaking up and correcting the lies put out there by those hacks. Elected politicians who get a lot of money donated to them by anti-vaccine special interests are also to blame for something that reeks of corruption. In short, everyone is responsible for this shameful chapter in public health history. We had measles and other vaccine-preventable diseases beat, but we’ve allowed them to come back because we seem to think that parents are the best judges of what is good and what is bad for their children. They’re not. They may be the best advocates for their children, people we can trust will act with in the best interests of the children 99.9997% of the time. However, if they are misinformed fools who think that vaccines are toxic or vaccines make people toxic, or cause autism and whatnot, then they will act wrongly when it comes to what is best for their children and for society in general. These idiots are walking around with their college degrees in non-science fields thinking that they somehow are knowledgeable in science-related matters because they can google terms and read websites and blogs that confirm their biases without a shred of evidence. They think that they can skip vaccines because, hey, people survived vaccine-preventable diseases all the time. Most of the people who went to war returned from that war. It doesn’t mean that war is not deadly, painful, scarring, and costly beyond human comprehension. So take a good look at yourself in the mirror right after you read this and ask yourself if you did everything possible to counter the lies and misinformation put out by anti-vaccine luminaries like the morons at Age of Autism or RKF Jr. and his anti-thimerosal brigade. Did you donate to organizations like Every Child By Two, Voices for Vaccines, or Immunize.org? Will you counter your friends and neighbors on whatever medium if they say that vaccines don’t work? The ball is in your court. It really is, no matter how much or how little you think you influence the world. Eradicable diseases like measles are not being eradicated because the most infectious thing, fear, is being allowed to spread without countering it with the most effective thing against it, knowledge. When we last met, I told you how the anti-vaccine crowd were not the only ones to blame for the current resurgence in vaccine-preventable diseases. One of you mentioned how pediatricians who cater to anti-science views are to be blamed as well. I almost forgot about the likes of Dr. Jay Gordon and Dr. Bob Sears, and others. Thanks for reminding me. The one thing I did not do was absolve the anti-vaccine activists from any blame. Certainly, when you are outspoken about things that have been proven to be wrong to you, when you write about them here and there and post videos on YouTube and other places to continue to try and convince people of lies, then there is plenty of blame to come your way. Hat tip to “Lilady” for a pointing me to this ridiculous blog post over at Age of Autism, the daily web newspaper of the non-existent autism epidemic. Remember, for them to continue to exist there must be an autism epidemic, and for them to continue to be supported by anti-vaccine luminaries like Andrew Jeremy Wakefield, this “epidemic” must be caused by the MMR vaccine. They certainly walk a fine line by also blaming thimerosal, which was never in the MMR vaccine. Look at it this way: If any of the thousands of studies done to find a causal link between thimerosal and autism were proven to be true, then the MMR-autism causal theory would get blown out of the water. It’s a fine line indeed. Anyway, the blog post in question is titled with the ridiculous question of “Should we be concerned”? (No question mark on their title, though.) It is written by the first half of this pair of American Loons. The reasonable person’s answer to that question is “Yes! Yes, we should be concerned. I mean, my God, we almost eradicated the goddamned virus, why the hell is it back?” But the authors at AoA and a majority of their readers don’t seem like reasonable people for me. So, of course, articles like that will find a natural home in that blog. Did you catch it? He is trying to tell us that the unvaccinated are not to blame because there were a handful of cases where vaccinated people caught it and spread it. Like the two things are mutually exclusive. Of course vaccinated will still catch measles. The vaccine is not 100% effective. There will always be those for whom the vaccine doesn’t trigger immunity. But, because people are willingly not getting vaccinated, the number of non-immune is bigger than it has to be. In every single outbreak of a disease for which the large majority of people are immunized, there will be a majority of people who are immunized and are cases. However, when you break it down to relative risks, those who are vaccinated are less likely to be part of the outbreak. In 1995, there were 301 confirmed cases of measles in the United States. That’s an important number because, at the time, it was the lowest number of cases in the country since we started keeping more accurate records of measles in 1912. Ah, yes, silly us. We thought that children who have to deal with malnourishment, malaria, HIV/AIDS and all sorts of other existential threats could do without measles, but Mr. Miller smashes all causes of death together to tell us, basically, that we should stop vaccinating because children are still dying. The level of flawed reasoning is astounding. “Yet 58 of every 1000 infants still died before their first birthdays,” he writes. You know what they DID NOT die from? Measles. Mr. Miller doesn’t tell us how much higher the death toll would be if these children also had to face vaccine-preventable diseases. Another frequent reader of this blog, “Todd W.”, decided to step into the murky waters of the comments section, and I applaud him for that. But you can read for yourself that it is hopeless. Immediately, his credentials were questioned, and they wondered if he was being paid to comment. He was told that he reads “like a CDC commercial”. (Have you seen any commercials brought to you by CDC?) But, again, that’s par for the course for the quacks and hacks that know very well how to manipulate words and numbers to please their crowd. You’ve probably heard of the Hippocratic Oath, an oath taken in one form or another by the majority of graduating medical students in the United States. One of the major tenets of the oath is the principle of beneficence: do no harm, prevent any harm, relieve any harm. A physician, and basically anyone who has decided to devote their life to medicine, is morally, ethically, and even legally bound by this principle. They must not cause any harm through their medicine, or take reasonable steps to not cause it. They must prevent their patients from being harmed, or take the reasonable steps to prevent said harm. And they must relieve any harm being caused to their patients, or do the reasonable thing to bring about this relief. I threw in the reasonable clauses there because physicians and other healthcare providers can only do so much. Patients are in many ways responsible for their actions, but it is up to the provider to give proper guidance and counseling based on all the available evidence. All the available evidence on the MMR vaccine (the vaccine against measles, mumps, and rubella) is that it works very, very well and is very, very safe. Any person getting both doses of the vaccine is over 99% likely to be immune against measles. As an epidemiologist, when I’ve investigated outbreaks of measles in the literature, I’ve found that very rarely are there vaccinated people in the group of those who are sick. In my personal experience, I am yet to find a vaccinated person with measles. (Mumps is another thing. The vaccine seems to wane when it comes to mumps.) So the vaccine is 99% effective. But is it safe? Yes, yes it is. Despite any claims to the contrary, there are no links between the MMR vaccine and any of the ailments exaggerated by the anti-vaccine crowd. It doesn’t cause autism. Very, very few people get more than a local reaction to it. Rarely does it cause encephalitis, but that clears up on its own. In short, the vaccine has prevented measles cases in orders of magnitude greater than any injury it has caused. I will bet my life’s savings on the vaccine any day of the week over a bout of measles. With modern medical technology, measles is less of a killer than it was before the vaccine, but you still don’t want to get it. It can be crippling, incapacitating. To recap so far: Vaccine good. No vaccine bad. Thus, based on the principle of beneficence, healthcare providers must recommend and give the MMR vaccine to their patients to prevent a harm called measles, especially when there is an outbreak of the bug going on in their vicinity. One physician in the United States who graduated from Georgetown University is Robert “Bob” W. Sears, MD, FAAP. He went through medical school and must have learned about immunology, virology, and maybe even some epidemiology. He is board certified in pediatrics. If I were a betting man, I’d bet that he knows all about the Hippocratic Oath and about beneficence. It’s just that (to me) he acts like he doesn’t, or like he doesn’t understand the things he should have learned in college and medical school, and beyond. Why? Because of his stance on vaccination. And take the word of the world’s authorities on vaccination science. 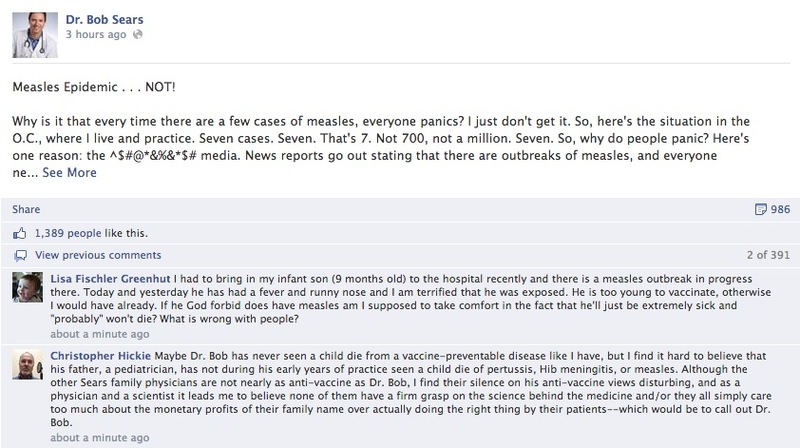 Still, you might be inclined to think that Dr. Bob is not anti-vaccine. After all, he’s not saying that you should stop vaccines altogether. He just wants you think that you can delay the administration of them because… Because something. I don’t know why. There’s no real reason to do so; No scientific reason, anyway. “Measles Epidemic . . . NOT! I do wonder if Dr. Robert “Bob” W. Sears is acting like a physician and recommending the vaccine to his patients in a time of a measles outbreak in his state, under the principle of beneficence? What kind of specialized knowledge does Dr. Bob have that the California Department of Health doesn’t to assure his patients that there is no outbreak of measles in the state, though there are ten times more cases right now than this same time frame last year? If anyone has answers to these questions, let me know. I’m not asking them rhetorically. This is a pediatrician, a board certified physician, blowing off information from public health authorities. It is in the public’s best interest to know if one of the physicians charged with taking care of the public’s children is not acting like a physician and more like an anti-vaccine activist. Well, if he is not anti-vaccine, then I’m the Prime Minister of Burundi. I mean, he is the administrator of a goddamned anti-vaccine, private Facebook group. So has he been lying when he says he’s not anti-vaccine? Probably. I’d have more respect for the man if just came out of the anti-vaccine closet and proudly proclaimed to be anti-science, like other medically-trained healthcare providers have. Then we wouldn’t have to play this game of exposing Dr. Robert “Bob” W. Sears to the world for the anti-vaccine activist that we see in him.